Gallup, New Mexico, called “Nanizhozhi” in Dine’ (Navajo), is indeed a “crossing point” that all roads lead to and where a rainbow of cultures live and thrive. Obviously, it places an emphasis on the Native American culture and settings in just about every aspect that can produce a profit in the “Indian Capital of the World”. One of the attractions that Gallup has marketed is the trails that lead into the nearby Red Rock mountains, of which the City takes absolutely zero responsibility for when it advertises the scenic paths and are now littered with trash left behind by the visitors who traverse the trails. They disrespect the land by leaving their trash and leaving the trails, destroying the cryptobiotic crust that has taken centuries to create for life to grow, destroying medicinal plant growing areas and disturbing sacred sites; they inscribe their names into the mountain walls and vandalize signs and trespass onto private property. A Navajo Nation sign that reads “Private Property No Public Access” has been destroyed but is still standing. An 1888 inscription is one of the first signs of vandalism on the mountain walls was left by a non-native visitor who set the precedent; other dates go back to “1941”, “1969”, “90”, “6-22-94” and “2011”. There is even a gangster tag of “18 st” on one wall. There were no streets in ancient times. 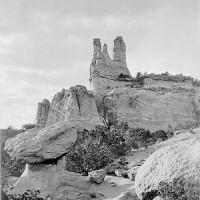 The most visible damage to the natural environment is the huge land tract north of the Church Rock Post Office that has been razed by Gallup directives and employees. The area once grew the most abundant harvest of “Navajo Tea” that is now gone for as long as Gallup exists and sees a way to make money off the land it seized to make an RV Park. Some of the reasons Navajo Warrior Larry Casuse fought to the death for on March 1, 1973, are the very facts of the continued exploitation of Native Americans by the City of Gallup and the events like the annual Ceremonial. He was the co-founder of “Indians Against Exploitation”. 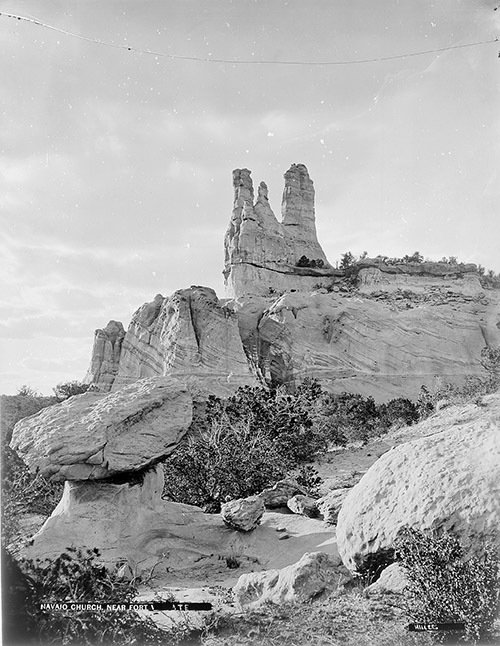 Whether you are a resident of Gallup or an out-of-town visitor, you can begin to respect the land my Dine’ ancestors have dwelt upon for thousands of years by taking a bag for your trash and even picking up some that has been left behind by others. Stay on the clearly marked trails and do not bother the Dine’ resident’s homes or the residents themselves or their sheep and property. A sad note to end this letter is the fact that a family of eagles used to live on the Church Rock pinnacles; in the 1970’s an Anglo man climbed up near the nest, became stuck and an emergency rescue was needed to bring him down safely. The eagle family moved to Pyramid Peak where it was once again disturbed by hikers. Since then, they have left never to return. Respect the land and take care of it and it will respect you and take care of you, my elders taught me; now I share this teaching with you.